Fast, easy and nutritious, protein Vita Energy shakes are a crucial part of any training regimen and a healthy lifestyle. But protein powders can be difficult to mix, resulting in a lumpy and less-than tasty mixture. 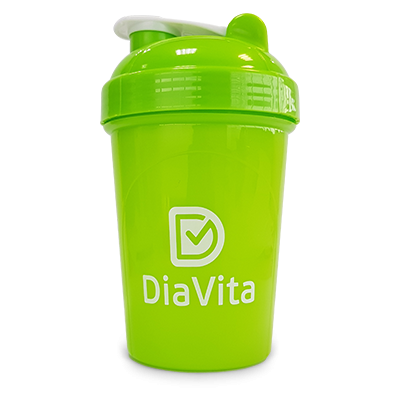 For smooth and delicious protein drinks, you just need a green helper - DiaVita «Shake it easy!» Protein Shaker. Heavy duty threaded top to give you a secure seal and avoid spills. Be active and don’t afraid to shed you cocktail. Helps to dissolve the protein powder and to get a perfect smooth lump free shake. Will help to calculate ingredients for your perfect shake.